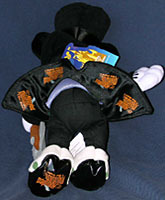 Disney has made big money on their plush dolls sold at the parks, so it was only a matter of time before they jumped onto the big, now long defunct, bandwagon of smaller sized "beanie babies." They wasted no time beanie-izing everything they could, including the Haunted Mansion. The first set of Mansion beanies produced were of the three Hitchhiking Ghosts, but since they were of such poor quality, and I was younger and poorer at the time, I passed on them. Therefore, I do not have them. What I do have, though, are three beanies I picked up during my last trip to Walt Disney World. 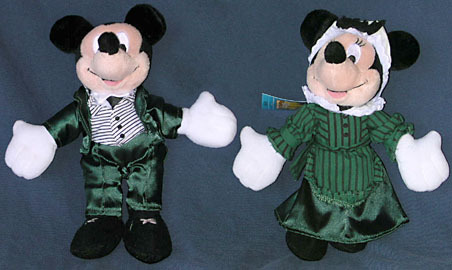 They are Minnie and Mickey dressed in the castmember costumes for the ride and a second Mickey in the same suit, but with a black overcoat and top hat and a plush shovel sewn to his hand. 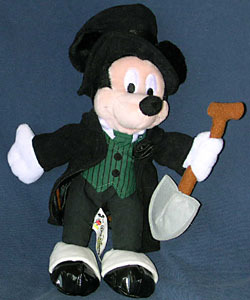 That undertaker Mickey is just lame and bizarre, but the other two are actually kind of cool because I do like the cast member costumes for the Mansion, so it's neat to have those purchasable... in a way. But, ultimately, you know what? These are just plush dolls with a handful of fake beans in their torsos. What can I really say - "they rock my world!" or something? Hell no, they're just stupid little dolls that I bought cause I'm a mansion freak and will buy just about anything Mansion related (if I have the money)! I can't review these, it's just too ridiculous, I have to draw the line somewhere - my journalistic integrity must prevail! No longer can you rely on my descriptions, you must make up your own minds - let the pictures speak for themselves!!!! Day 6 and Rustin's already phoning it in? Yell at him on our message board, the Loafing Lounge.